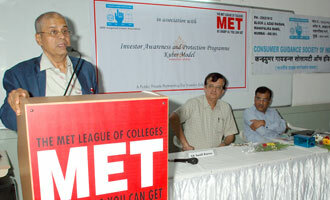 Home > Campus News > From Dalal Street to MET! As part of the 2 Decades Celebrations and being an NGO, MET League of Colleges in association with the Consumer Guidance Society of India - CGSI (SEBI recognised investor association) conducted workshop on ‘Investor Awareness and Protection Programme (IAPP) – Kuber Model’. This event was well attended by MET staff, faculty and students and was a marvellous learning experience.